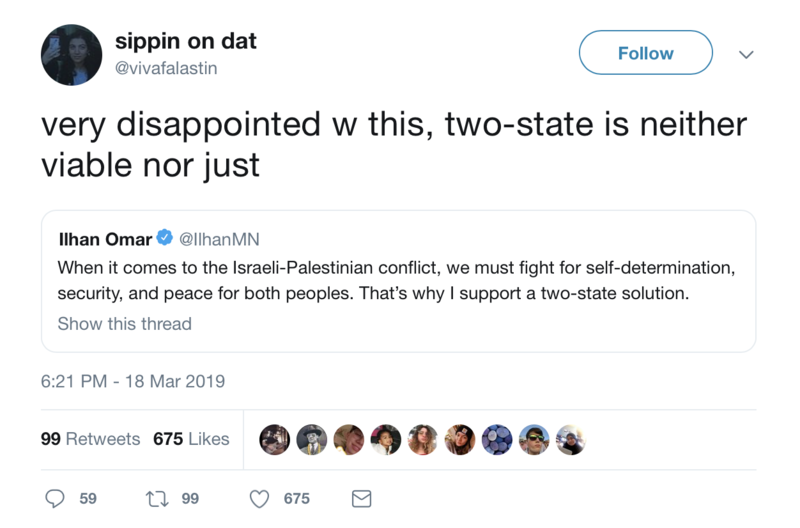 The New York University (NYU) student who partly blamed Chelsea Clinton for the New Zealand mosque shootings also expressed her displeasure Monday with Democratic Rep. Ilhan Omar for supporting a two-state solution. Omar’s tweet was a part of a thread detailing her foreign policy stances that she also addressed in a Friday op-ed with The Washington Post. Dweik was one of the activists who confronted Clinton at the school’s vigil for those killed in New Zealand on Friday, claiming that her rhetoric toward Omar led to the attack. Dweik’s criticism of Clinton was in response to the comments Clinton made against Omar last month after the Minnesota congresswoman accused the pro-Israel lobbying group American Israel Public Affairs Committee (AIPAC) of buying pro-Israel support.